This redesigned section of our webpage is dedicated to vintage audio amplifiers and general guidelines on how to use them. ​We have created five new sub-categories under the AMPLIFIER menu button where our collection of vintage amplifiers are neatly displayed in decades and presented in alphabetical order. Before plugging the power cord into the AC wall socket check if the voltage selector of your amplifier is set to the voltage requirement of your area. Before doing anything else, connect the speakers. Stereo amplifiers usually have speaker output terminals for 1, 2 or even 3 sets of speakers. They are usually labelled SPEAKERS A and SPEAKERS B. Unlike surround sound amplifiers where all the speakers are located in one room these two sets were provided for MULTIROOM operation. (speaker system A for speakers located in one room A, while speaker system B in another room) Check the label at the back of the amplifier. The most common rule is that you can use 4 ohm speakers if you intend to use only one pair of them at a time. If you want to use the two speaker sets simultaneously you need to use speakers with 8 ohm impedance or higher. 3. Now let's connect our first source to the amplifier. For example a turntable (the vinyl player). 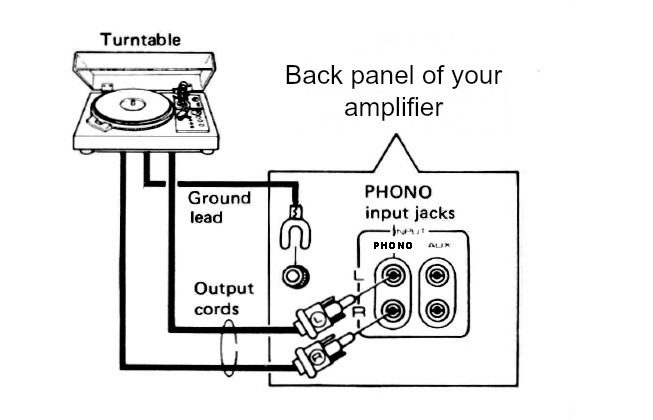 Connect the turntable outputs to the PHONO jacks at the rear of your amplifier as shown in the picture. Connect the ground lead of the turntable to the GND (ground) terminal on the amplifier. In most cases the PHONO input on the amplifier can accept turntables fitted with a moving magnet (MM) type cartridge. 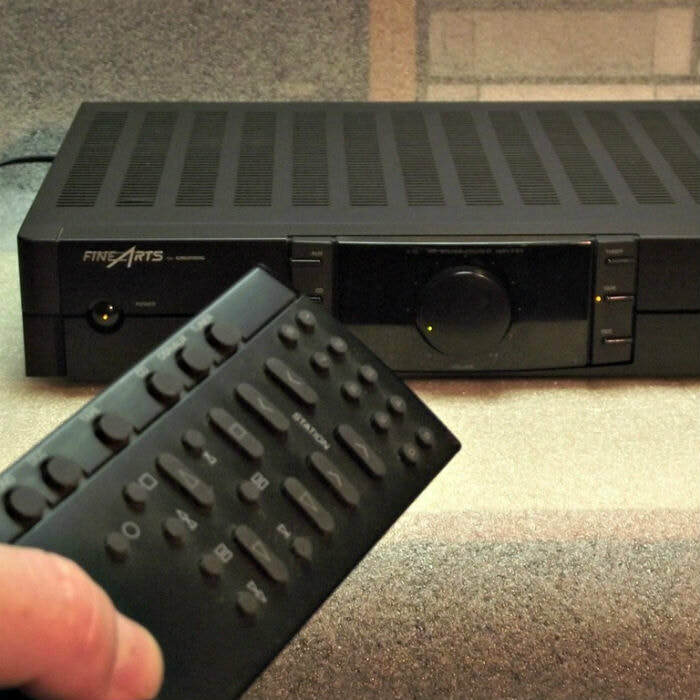 The PHONO input is a special type of input and is different from all the other inputs of an amplifier. Most vintage turntable and most modern turntable must be connected here. 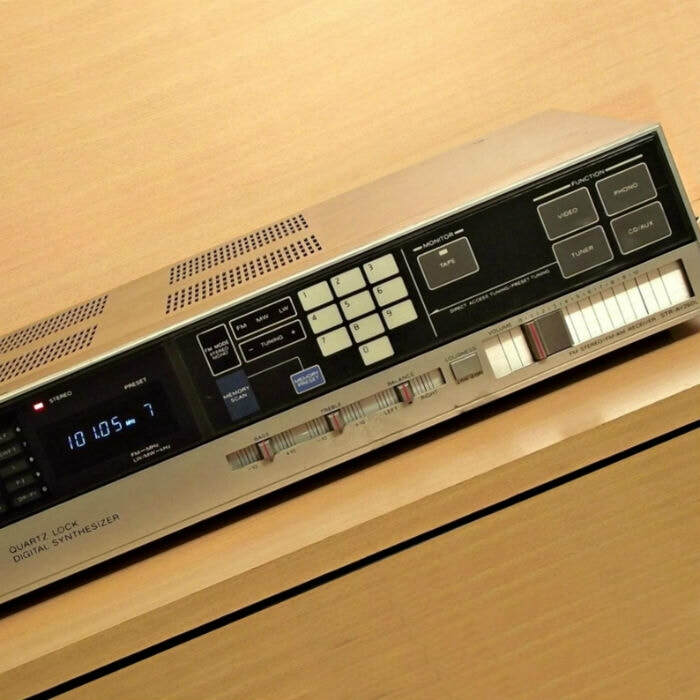 There are some exceptions as some modern turntable (usually low budget models) are already fitted with a preamplifier module inside the turntable so they can not be connected to the PHONO input but you can connect them to any other input on your amplifier. Select the speaker switch that corresponds to the speaker system which is connected to the SPEAKERS terminals on the rear panel. Set the balance control to the center position. Make sure the volume is set to minimum and switch the units on. Start playing a record (vinyl) on your turntable and increase the volume to the desired level. Gamma I, Beta I and Alpha II. POWER. Before you touch this one, make sure you have followed steps explained in the previous paragraph. Set this switch to ON to supply power to the amplifier. There is a short delay when set to ON, because the muting cicuit has been actuated to supress the unpleasant noise that is sometimes generated when the power is switched on and off. SPEAKER SELECTOR Use this to select the speaker systems. If set to OFF there will be no sound from speakers. You can use this position when want to listen through your stereo headphones. If set to A there will be sound obtained from speakers connected to the A speaker terminals. If set to B there will be sound obtained from speakers connected to the B speaker terinals. 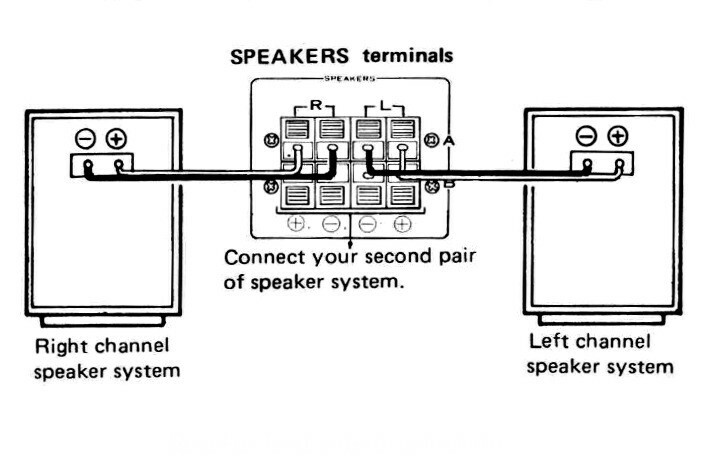 If set to A+B there will be sound obtained from speakers connected to both A and B speaker terminals. SUBSONIC FILTER The subsonic filter serves to attenuate frequencies lower then 15Hz. It is therefore effective in suppressing ultra-low frequency noise which is generated by record warp and other causes. You can not actually hear this noise but it is a factor in the generation of intermodulation distorsion and it may damage your speaker system. Set this switch on during record (vinyl) play for the best effect. HIGH FILTER The high filter serves to attenuate and suppress high frequency noise from scratches on records or tape hiss. VOLUME Use this control to adjust the output level to the speakers and headphones. Turn it clockwise to increase the output level. No sound will be heard if you turn it counter clockwise until stop. TAPE DUPLICATE SWITCH Use this switch to select copy direction from one tape to another. 1>2 Use this position when playing back a tape on a deck conected to the TAPE 1 jacks and recording (duplicating) on a deck connected to the TAPE 2 jacks. 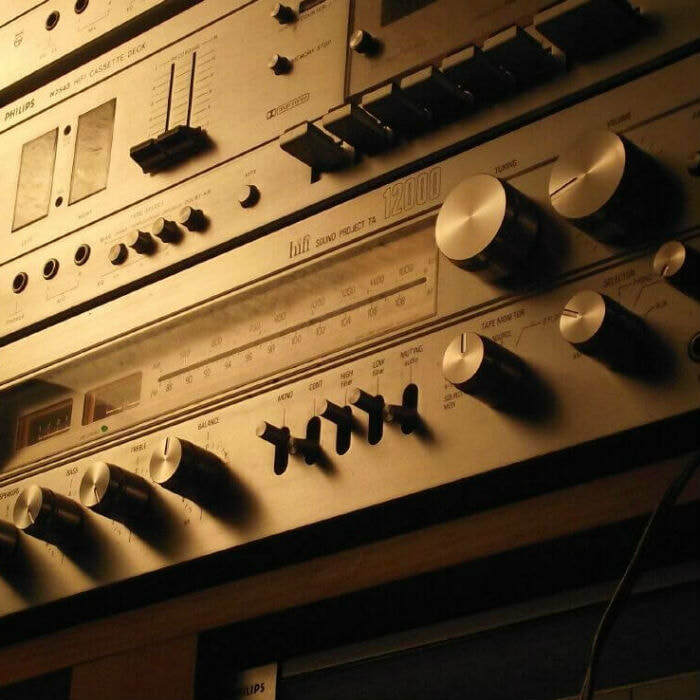 2>1 Use this position when playing back the tape on a deck connected to the TAPE 2 jacks and recording (duplicating) on a deck connected to the TAPE 1 jacks. OFF Set to this position when not duplicating. FUNCTION SELECTOR Use this selector to select the program source. BASS AND TREBLE CONTROLS Use these controls to adjust the bass and treble. If you turn the BASS control to the right from it's center position you will emphasize the low frequencies. Conversely, turning this control from the center position to the left will attenuate the low frequencies. Use the TREBLE knob in the same manner for high frequency sounds. The frequency where these adjustments are made are preset values (i.e. 100Hz for bass and 10,000Hz for treble) On some units you will find a turnover switch which allows you to select from two frequencies where these adjustments have effect. BASS TURNOVER SWITCH Use this switch to change over the frequency in which the sound adjustment with the bass control is starting to take effect. Select a value in accordance with the characteristics of your listening room and your speakers, and with your general preference. TREBLE TURNOVER SWITCH Use this switch to change over the frequency in which the sound adjustment with the treble control is starting to take effect. Select a value in accordance with the characteristics of your listening room and of your speakers, and with your general preference. TONE SWITCH Set this switch to ON when adjusting the bass and treble controls. When set to OFF, the tone control circuits are disengaged and frequency response is flat. BALANCE CONTROL Use this control to balance the volume of the left and right channels. First, however, set the mode selector to MONO and adjust so that the sound appears to come from somwhere exactly between the two speakers. If the sound appears to be louder on the right, it means that the volume of the right channel is higher. Turn the BALANCE control to the left and adjust. Conversely, if the sound appears to be louder on the left, it means that the volume of the left channel is higher. Therefore, turn the balance control to the right and adjust. After adjusting, return the mode selector to STEREO. LOUDNESS SWITCH When listening to a performance with the volume control turned down, set this switch to ON and the bass and treble will be accentuated. When the volume is low, the human ear finds it harder to hear the bass and treble than when the volume is high. The loudness switch is thus designed to compensate for this deficiency. By setting it to ON, the bass and treble come through much more strongly and the sound takes on a punch even when the volume control is turned down. MUTING SWITCH Set this switch ON to attenuate the audio output without the need to adjust the volume control. Use this switch when turning down the audio volume output temporarily and when changing over records or tapes.